Back in the Sierra Nevadas, having exhausted myself walking up the mountain at 7,000 ft., I came down to the village to walk beside the lake, really a pond that holds the water for the fire department. One side of the water is thick with cat tails and behind there is a slope covered with deciduous bushes of different hues, including a soft red. Suddenly, I had a flash of standing beside the Indian River with my grandmother, Gladys, when she was the age I am now and I was 42. She and I had found ourselves single and living alone that summer. Her son had gone off to live with his best friend’s wife, best friend having passed to his reward. Gladys had left the farm and gone to live in a small house on the Quebec/U.S. border. Meanwhile, my husband, daughter and son had gone off in their own directions. Gladys and I were heart-broken and yet she still made me laugh. She recalled a day in her first home, a farmhouse. It was spring cleaning time and she had hired a French Canadian girl whom I remember later as Aunt Kate. Kate was cleaning upstairs, when she suddenly came rushing down yelling, “Gladness, Gladness, the house is on fire.” It burned to the ground. All that was left was a stone-lined cellar hole. Gladys roared with laughter as she imitated Kate. They didn’t lose everything. The “men” -two of them would have been about 12- must have smelled the smoke or heard the sound of pots smashed together that called them back. They rushed in and grabbed the first thing the saw, the big round oak table, which immediately got jammed in the door. Gladys screamed and yelled. They pushed and shoved. Finally the door jam yielded and the table flew out, but precious time had been wasted. Other men began to arrive and grab what they could. Some things Gladys loved were lost and the family of 6 was homeless. But in the country, someone can always squeeze in a family of six. Twenty seven years later, the family had changed shape. My mother, who was 13 when the house burned, was married as were her next three brothers. But there were still three children at home, more or less the same age I was and I was 19. This house, too, caught fire. Once again the men seized the oak table first. Once again it got stuck in the door and Gladys screamed, “Leave that damned thing to burn”. Gladys never damned anything. It was the worst word to her. They didn’t leave it. See above. The third house was built by the community across the road from the second one. The porch was smaller but screened. There was a coal furnace in the cement cellar and no longer needed to be insulated on the outside with banks of sawdust. And there was an actual bathroom. Until 1955, the old out-house had stood at the back of the wagon shed and only little children could use the commode inside. Gladys was very happy there. Her kitchen stove had a wood side for heating and an electric side for cooking. She had hot and cold running water, which ran into a claw foot tub. Many a visit, we sat at the much despised round oak table and laughed. We laughed about the time that four of us, aged 11 to 13 decided to jump in the hay. It wasn’t a dangerous sport once the new hay had been harvested, but it hadn’t. All there was in the mows was last years hay, so low in the mow that it could be pulled down through the lowest door. Moreover it had compacted and was hard. I was 13, Evelyn and Ted, twin aunt and uncle, 11 and Percy, 10. The boys dared us to go out onto the side beam that led across the mow from the barn floor (ramp) and jump from there. Sure, we girls said we can do that. The boys went first, sliding on their bottoms far across so as to leave space for us. I went next, noting as I began that it was at least 20 down. I could barely move. Finally, Evelyn began the crossing. We were all scared but she was terrified. She didn’t want to lose face in front of her brothers and once, embarked, she couldn’t go back either. My sisters, Georgia 7 and Anne 5 stood watching on the barn floor. I was sweating and gripping the beam. First Ted and then Percy launched himself off into the air with a bloodcurdling whoop. They would crash together, I thought. Both disappeared. A few seconds later their heads appeared as they dug themselves out of the dusty hay. I knew I couldn’t do it. “Go back, Evelyn,” I cried. “I can’t move”, she said. Me neither, I thought. I studied the mow. The boys were urgently calling us to jump. “It’s fun. It’s not so bad.” My stomach heaved. I had to go to the out-house. I jumped. The worst part was drowning in hay dust and desperately scrambling out. But now we had another problem. Evelyn was deaf to our pleading. She was weeping in terror and hiding her face in her shoulder. “Go get Ma,” Ted yelled to my sisters. They clomped off down the wooden ramp. Crying and yelling ensued while we waited. Then Gladys was there with her small grand daughters, wiping her hands on her apron, and clearly not happy. 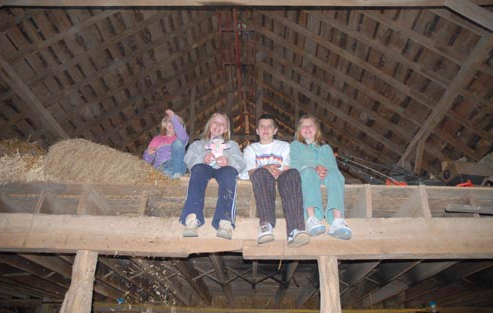 “What in the name of heaven were you kids doing out on that beam?” We always jumped from the barn floor and never into low hard hay. “Get back here,” she screamed at her daughter. Evelyn protested she would die if she did. Evelyn threw herself headlong, screaming, and landed on her face. We pulled her out and I dusted her off, but she continued to scream that it was all our fault. The boys and I ran across the hay, through to the mow over the cowshed, down the trap door, out through the empty cow shed and up around the barn. There on the dirt ramp, stood Gladys, her face in her apron, laughing so hard her body shook. My little sisters, who were totally unused to laughter, clung to her skirts.